Set an early alarm for this bucket list event around SF. Get an all-access pass to the SF sights, including the Golden Gate Bridge and Fisherman's Wharf, and take up the challenge (expect hills - it's SF after all). Come for the finisher's medal and atmosphere of the on-course cheer stations. Find out for yourself when you run the 42nd annual Biofreeze San Francisco Marathon. Take in the sites and sounds on your run-cation in San Francisco, while you visit and run with us. This is the premier west coast running event. We are USATF certified and a Boston qualifier. We are hilly, we are fast, scenic and unforgettable. You will join 27,000 other runners and run along the Embarcadero, Fishermans Wharf and Crissy Field; speed past landmarks like Coit Tower, Golden Gate Park, and AT&T Park; and pound the pavement through San Franciscos liveliest neighborhoods like Haight-Ashbury and The Mission. Choose from 4 distances: Marathon, two Half Marathons, 5k and Ultra Marathon and Run the Bay with us!! Picture yourself racing as the California sun breaks through San Francisco’s iconic maritime fog. Bursting from the Embarcadero’s waterfront start line at the break of dawn. Racing through towering eucalyptus and redwood trees in Golden Gate Park. Passing AT&T Park with its atmosphere of game day anticipation and the crack of the bat. Join over 27,500 runners to take on our 26.2 mile loop USATF certified course (we’re also a Boston Marathon Qualifier and Olympic Team Time Trials Qualifier race) and take yourself on a running tour of San Francisco. Race Finish: Main Marathon Finish Line @ Folsom Street and The Embarcadero, San Francisco, California 94105. Run past iconic landmarks, across the Golden Gate Bridge, and through historic neighborhoods: Runners race through San Francisco in a loop. In order to qualify as an Official Full Marathon Finisher, you must finish within the 6 hour course limit. The Full Marathon includes 16 water stops where you can find water, nuun Performance electrolyte and carbohydrate drink, medical, and toilets. Water stop 5 and 10 include GU energy chews. Course Certification: The Full Marathon course is USATF certified and a Boston Marathon and Olympic Time Trials qualifying race. Race Start: 6:30AM @ Mission Street and The Embarcadero San Francisco, California 94105. Free runner shuttles take runners from the 1st Half Finish Line in Golden Gate Park to the Main Finish Line Festival from 8am – 11am. See below for more information. Race route: Runners race along The Embarcadero, up to the Golden Gate Bridge, to the Coastal Trail along San Francisco Bay, through Golden Gate Park, and more! Race Distance: 13.1 Miles. In order to qualify as an Official 1st Half Marathon Finisher, you must finish within the 3 hour course limit. The 1st Half Marathon includes 6 water stops where you can find water, nuun Performance electrolyte and carbohydrate drink, medical, and toilets. One of these stops, water stop 3, includes GU energy chews. Race Start: 6:45 am @ Golden Gate Park, JFK Drive & 14th Avenue Meadow, San Francisco, CA 94118. Free runner shuttle bus take runners from the Main Start Line near The Embarcadero to the 2nd Half Marathon. Run through Golden Gate Park and historic local neighborhoods: Runners experience the 2nd Half of the Full Marathon. Course Certification: The 2nd Half Marathon course is USATF certified. With a start beneath the towering redwoods in Golden Gate Park and a prized finish at Cupid’s Arrow along the Embarcadero, The Biofreeze San Francisco Marathon’s 2nd Half Marathon course winds through city streets, offering a locals’ only tour of the city’s treasured vistas. Racing beside the Conservatory of Flowers, through the Haight-Ashbury and Mission neighborhoods, beside AT&T Park, under the Bay Bridge and more, each runner’s journey unfolds against an unforgettable sense of place. Join our Full Marathoners as you take on 13.1 miles, the 2nd Half of our Full Marathon course. Our 2nd Half Marathon is popular with runners looking to set a PR. Due to its low elevation profile and a gradual finishing descent toward the Embarcadero, many runners return to this course year after year to test their limits and reach new heights. In order to qualify as an Official 2nd Half Marathon Finisher, you must finish within the 3.5 hour course limit. The 2nd Half Marathon includes 10 water stops where you can find water, nuun Performance electrolyte and carbohydrate drink, medical, and toilets. One of these stops, water stop 4, includes GU energy chews. Take part in the inaugural Saturday 5K race. Join our Double Up Challenge for extra fun! Or join 27,000 other runners as you take to the streets of San Francisco on Sunday. Race Start: First Loop: Saturday 11:00 pm @ Mission Street and The Embarcadero San Francisco, California 94105. Course Highlights: Run the San Francisco Marathon back-to-back in this epic fundraising event. Course Certification: The Second Loop (The Biofreeze San Francisco Marathon Full Marathon) is USATF Certified. Earn both the Ultramarathon and Full Marathon Medal. Race Distance: 52.4 Miles. Ultramarathon participants will begin on The Embarcadero and run The Official San Francisco FULL Marathon course in reverse: under the Bay Bridge and around the Giant’s Ballpark, through Mission Bay, Potrero and Mission Districts, up Haight Street and into Golden Gate Park. Ultramarathon participants will head down to the ocean and run along the Great Highway before coming back into Golden Gate Park and then up into The Presidio. From there, 52.4 participants will head through the Marina, Fisherman’s Wharf and back to the Main Start on The Embarcadero where 18,000 runners will be waiting to join you on the second leg of your 52.4 mile adventure! The first loop of the Ultramarathon is NOT a closed course. Participants need to stay on sidewalks and to the side of the road. 100% of the course is on paved roads. Maps and directions will be provided to each 52.4 participant for the first loop. The Second Loop: The Biofreeze San Francisco Marathon is a loop course, taking runners on a journey around the city, hitting gorgeous locales and iconic landmarks all along the way. Starting at the world famous Ferry Building, racers head along the Embarcadero, with the beautiful San Francisco bay on their right. From there they pass through Fisherman’s Wharf and through the Marina. Next runners head up and back across the Golden Gate Bridge and down through the Presidio, along the Pacific Ocean. A tour of the beautiful Golden Gate Park follows, and after some turns and curves through the trees and around the lakes, runners empty out onto the historic and very colorful Haight street. 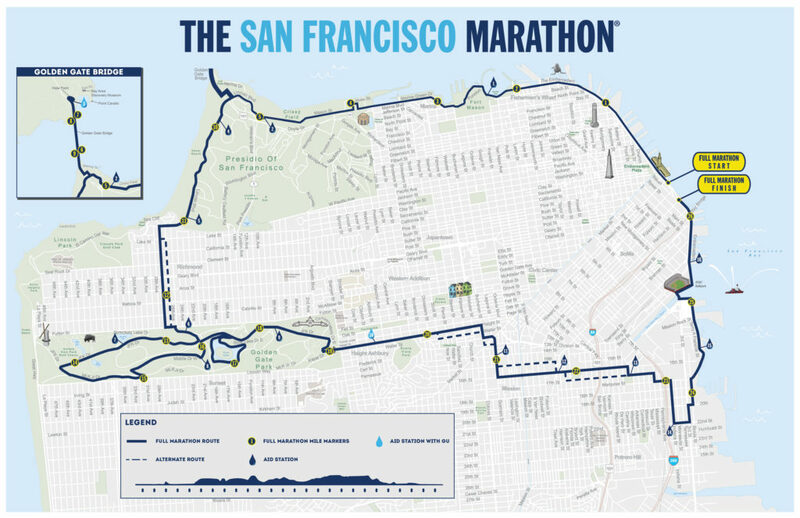 The course takes some loops through the Mission, Potrero, and Mission Bay Districts, heads by numerous charming little parks, then heads up towards AT&T Park, home of the San Francisco Giants. And then it’s just a home stretch, under the fancy new Bay Bridge and back up to the Ferry Building. The Biofreeze San Francisco Marathon will provide on course support via course monitors in cars and on bicycles that will travel the first loop with the 52.4 participants, stopping at designated areas along the route and checking runners in at each stop. Aid stations will support 52.4 participants during the first loop only. Volunteer Teams will be assigned to the aid stations and will be equipped with first aid supplies, water, fuel and food. All 52.4 participants have the option of providing The Biofreeze San Francisco Marathon with a drop bag of their own food and supplies. 52.4 participants will be able to drop off their bag at the Ultramarathon Tent at check-in on race day. The participant’s drop bag will be left at the 52.4 Tent. Ultramarathon participants will have access to their drop bag between the first and second loop and after the second loop. Drop bags should be securely tied and clearly marked with the the Ultramarathon participant’s name, bib number and phone number. Do not leave valuables in your bags. The Biofreeze San Francisco Marathon cannot be held responsible for lost bags. Please do not use paper bags, shoe boxes, or anything that can get wet and tear easily. 52.4 participants must pick up their drop bag after their second loop by 1pm. Bags not picked up or claimed within 72 hours of the event are donated to local charity. Wave 2, 3, 4: Howard St. Wave 5, 6: Folsom St. Wave 7, 8: Harrison St.
You don’t have to run to be a part of the The Biofreeze San Francisco Marathon experience. We encourage friends and family of runners and the San Francisco community to participate on Race Day (July 28th, 2019). Your presence and encouragement makes a huge, meaningful impact on our runners. We hope the following information helps our spectators prepare for race day. We love our volunteers and love that you want to support our amazing runners! Below are opportunities to volunteer this year as an individual or team, fill out our form here to submit your contact information and we’ll follow up! Head to the official event website for more volunteering information. Great to be able to run over the Golden Gate Bridge!! Good fun but early start.